Our respondents believe that there is a significant risk of deploying a more profound political crisis, including the parliamentary crisis, which increases the likelihood of early elections. Investors believe that if in the near future a new coalition and a coalition or a technocratic government are not formed, and the crisis situation around the General Prosecutor of Ukraine is not be resolved, political risk assessment will continue to deteriorate. 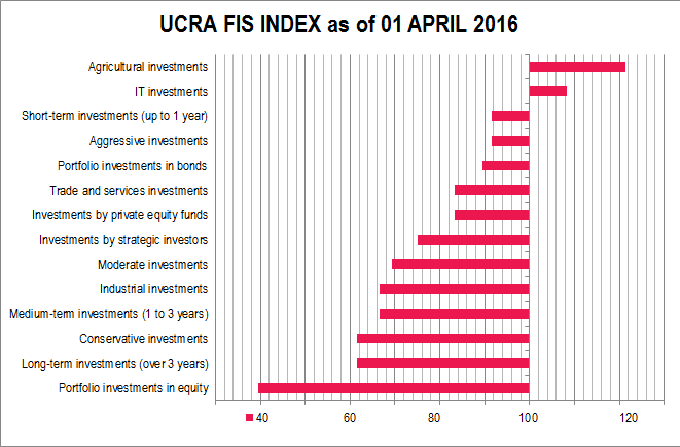 There are only 2 components of UCRA FIS INDEX still remaining in the positive zone: • assessment of the prospects of investment in agriculture, although sharply reduced (by 25.0 points), remained on the leadership positions with a value of 121.3 points; • assessment of the attractiveness of investment in IT degraded over the past month (fell by 13.9 points) to a value of 108.3 points. According to respondents, the prospects of investment in industry are continuing to deteriorate (from 77.8 to 66.7 points), while the change in the attractiveness of investment in the trade and services sector enjoyed a positive trend (rising from 72.2 to 83.3). Weak economic prospects of Ukrainian issuers of securities and foreign exchange restrictions on the market contributed to the further deterioration of assessment of prospects of such instruments as equity investments – this sub index fell to critically low value of 39.6 points. At the same time, the attractiveness of bonds was significantly increased (from 63.8 to 89.5). Prospects for private equity funds are perceived by our respondents as rather weak (83.3), which is only slightly better than expectations from direct strategic investments (75.0). The attractiveness of short-term investments is close to the neutral level (91.7), while the medium-term and long-term investments (66.7 and 61.5 points, respectively) are considered unpromising. Aggressive investment strategy (91.7), as has been the case over the entire period of observation, takes over moderate (69.2) and conservative (61.5) approaches to financing projects in Ukraine. UCRA FIS INDEX (Foreign Investor Sentiment Index) for Ukraine is a joint project of Ukrainian Credit Rating Agency (www.ucra.com.ua) and TRDATA UKRAINE (www.trdata.com). The index is calculated on monthly basis through a survey of the leading investment and consulting companies that assist in channeling foreign investments to Ukraine in order to assess the willingness of foreign investors to provide funding for Ukrainian companies during the next month. The resulting survey data is compared with the changes of the key market indicators for the previous month. The index calculation was carried out in the test mode since the beginning of 2015. Publication of the index commenced October 1, 2015.